Tucked in the wonderful neighborhood of Poudre City, this cabin has all the amenities that you need, all within outstanding access to hunting, fishing, hiking, 4×4 trails and wildlife viewing. The home is over 1,300 sq. ft. with 3 bedrooms, 2 bathrooms, a large dining room and an oversized living room for all of your gatherings. The home is on a well, full septic system and serviced by permanent electricity and propane. Why fight for a camping spot when you can own your own getaway? Driving directions: From HWY 287 and HWY 14 (Teds Place) Take HWY 14 31 Miles to Riverside Dr. on the Left, take first Right on Meadow Ln to property. 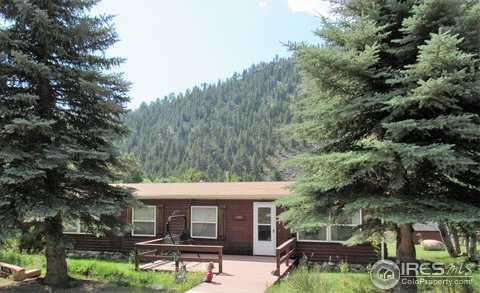 Please, send me more information on this property: MLS# 859521 – $219,000 – 185 Meadow Ln, Bellvue, CO 80512. I would like to schedule a showing appointment for this property: MLS# 859521 – $219,000 – 185 Meadow Ln, Bellvue, CO 80512.